The X-Pro1 is Fujifilm's first foray back into interchangeable lens mount digital cameras since the S5 Pro DSLR. While the Fujifilm DSLRs were all based on Nikon-supplied bodies (and thus used the Nikon F-mount), the X-Pro1 is an all-Fujifilm mirrorless design and introduces a new proprietary lens mount. The X-Pro1 gets a lot of its design attributes from the X100, Fujifilm's large sensor compact camera that was the surprise hit at Photokina 2010 and which provoked a "retro X" design spree at Fujifilm (X1, X100, X-Pro1, and XS-1). By retro design, I mean dials instead of buttons/menus to control key attributes, plus a return to 1960's overall styles. The X-Pro1 looks a lot like some of the classic rangefinder film cameras of the 60's and 70's. If it weren't for the LCD on the back, there'd be no clear giveaway that this is a digital camera. The X100 introduced not just retro design but an innovation: the hybrid viewfinder. In both the X100 and the X-Pro1 you have the choice of seeing an optical view of the scene with overlaid frame lines (the old rangefinder-style viewfinder, but without the actual rangefinder focus aid), or an EVF view. So while the camera is more akin to a rangefinder in size and shape, the hybrid viewfinder actually makes the X-Pro1 a bit more like a DSLR-like camera in actual use (assuming you use the EVF a lot). The viewfinder eyepiece, like many rangefinder cameras, is at the far left of the back, meaning big noses don't poke into the LCD (assuming you're right eyed). The optical viewfinder mode, like the X100 before it, has a lot of overlaid information (including approximate frame lines), including the ability to see a histogram, grid, and distance information. This is a big step up from the Leica M9 optical finder, and in some ways better than DSLRs, too. Unfortunately, the offset of the viewfinder makes parallax a real issue, and the frame lines, like that of virtually all rangefinders, are not nearly as close to accurate as you'd like. That's a shame, because the X-Pro1 sports a new 16mp sensor. What I found over and over again when I tried to use the optical finder to frame is that I ended up cropping to get what I thought I had framed, which means I was wasting some of those pixels. True, you've always got the EVF to accurately frame with, but neither the EVF or the OVF are perfect, thus you spend time moving back and forth between them and potentially missing shots. This is tricky territory, as I like the hybrid viewfinder in most respects. But what I'm trying to point out is that it isn't perfectly optimal in either of its modes. When I get into the handling and performance sections a common denominator are things that slow your shooting or reduce spontaneity with this camera. The viewfinder is one of those unless you just choose one mode and stick to it, which sort of negates the need for hybridness. The new APS-sized sensor is very interesting. You'll see a lot of sites writing that it uses a "random" layout of red, green, and blue photosites, but that's incorrect. The camera uses a sparse repeating pattern, it just isn't Bayer. Where the "random" comments come from is a mistranslation/misinterpretation of something Fujifilm said at the introduction. This new X-Trans layout is an attempt to mimic the benefits of random film grain, allowing Fujifilm to drop the anti-aliasing (AA) filter over the sensor. Bayer sensors have a tight, fixed pattern that can produce moire or color fringing in certain situations if there's no AA filter. X-Trans loosens the color portion of that pattern in a way that emphasizes luminance data. In so doing, Fujifilm has been able to skip the AA filter. You can see how the red and blue information is slightly off precise and fixed distance alignment, though the green information forms a very tight repeating pattern. The problem is this: 20 of every 32 photosites are green in X-Trans while 18 of 32 photosites are green in the Bayer pattern: there's 6% more luminance (green) information and 6% less color (red, blue) information. The advantage of that arrangement is moire suppression, lower luminance noise, and slightly better resolution. The disadvantage is a difficult demosaic (requires more processing) that is more prone to color noise and smearing. The smearing comes because there are areas with no truly adjacent color information in the sensor pattern—the demosaic routine has to extend out to more pixels to find missing color information for any individual location. If you're interested in the problem, Sandy McGuffog's blog at Chromasoft has a three-part article on the complexity of demosaicing the X-Trans sensor well. As Sandy notes, the real question is this: is the tradeoff worth it? The answer will be a bit dependent upon what you value, I think. We don't have a lot of well-tested, completely vetted raw converters to know for sure, but I think most people so far are reacting to the high acuity that the combination of 16mp, no AA filter, and good lenses provides. There's no doubt that from a sharpness/acuity/resolution standpoint, the X-Trans sensor is mostly delivering on its promise. The question is what is sacrificed to deliver that, and do you care? I'll have more to say about that in the performance section. An aside: Fujifilm is to be reprimanded for introducing a new sensor pattern into the market and not working closely with software developers prior to the launch (I'm not sure they're working all that closely after the launch, either). This is blatant disregard and disrespect for the serious photographers Fujifilm targets, in my opinion. We have an existing workflow. We don't want to be forced to change that workflow and our software mix to get good results from our raw files. So we're forced to change both camera and workflow to use an X-Pro1. Bad call, Fujifilm. But they're not the only Japanese company that keeps making this mistake. I keep hoping that some Japanese camera company will finally get over the software NIH (not invented here) syndrome and realize that there's a huge advantage to integrating new equipment into existing workflows. Huge. Simply put, the workflow of a majority of the world does not revolve around slightly oddball Japanese raw converters that can be licensed cheaply. This is a mistake the Japanese computer companies also made at one point, too. If Fujifilm wants to bundle Silkypix in its home market because it thinks that's the predominate workflow in Japan (I doubt it is, but I'll concede the point for the sake of argument), fine, do so. But the same way the Japanese aren't seeing and integrating with the Internet juggernauts, they're not seeing the photo software juggernauts right, either. If the X-Pro1 had a simple Bayer sensor layout, this wouldn't be that much of an issue: most people would just ignore the bundled software and use what they've been using. Unfortunately, by not working with the software developers to get best possible demosaics into every converter, we end up having to look more closely at the bundled software, as you'll see when we get to the performance section. Contrary to the popular notion floating around the Internet, moire suppression does not mean "no moire." It is likely that we'll find some things that trigger a mild form of moire, but overall, the camera suppresses moire enough that you can think of it as an AA filter with no downside. Suffice it to say that the sensor is unique and perhaps at the heart of what might make you lean towards an X-Pro1. It also might make you lean away from it. This is not a lot different than Fujifilm's earlier foray into serious cameras (Nikon mount DSLRs) and even many of their compact cameras. Much like Subaru has relied upon a different engine and wheel delivery system (the Boxer engine and symmetrical all wheel drive), Fujifilm relies upon a different sensor and demosaic than pretty much all its competitors. I have to say: while I've enjoyed Fujifilm's idiosyncratic contributions to the sensor side, they haven't really played out into great cameras. The closest they came was when they used the Nikon D200 body for the S5 Pro, but it came too little, too late, and with serious other performance issues. The X-Pro1 is another attempt, but now the body is as idiosyncratic as the internals. A few more minor things to cover before we get to the meat of the review: while the color LCD on the back looks small (big camera, remember? ), it's a 3" with slightly better than VGA resolution, which is to say, it's pretty good. The camera has a slight handgrip (fortunately rubberized). The flash hot shoe is aligned with the center of the lens, but the tripod socket is not. The X-Pro1 can do 1080P/24 video, but it's not really set up as a video camera. More so than almost any other recent camera I've seen, you can pretty much ignore the movie abilities. There's no button you'll accidentally press that will suddenly start recording movies on you (I'm looking at you NEX-7). Indeed, at the camera defaults you might not even be able to figure out how to start recording a movie (hint: reset the Fn button so that it triggers Movie mode). Here's a case where the marketing department got to check a box (records HD movies!) but the engineering department didn't do anything to take away from the primary function of the camera (stills!). You don't see that every day, that's for sure. The X-Pro1 has no built-in flash. An optional EF-X20 shoe mount flash is available for US$230. The flash will cover 14mm lenses on the X-Pro1 and has a GN of 20 (ft, 6.1m) at ISO 100 and the 35mm lens. Unfortunately, the only modes available are fill flash and manual (full to 1/64 power). The good news is that the flash takes only 2 AA batteries and is very small and light (3.5 ounces, or 100g). First up, let's get one thing out of the way: physically this is a rather big mirrorless camera. The body size is virtually the same as the Leica M9, and thus considerably larger than most of the other mirrorless camera models that have appeared. The smallest of the lenses sticks out about 2" (50mm) with the hood mounted (which it should be). Some people will like this size, some people won't. I happen to like it just fine, but if you're looking for small, this isn't your camera. Weight wise, the X-Pro1 is lighter than you'd expect from the size, though. That's despite the metal body frame, top and bottom plates. It's only a bit more than two-thirds the weight of an M9 body, so it doesn't have the heft you might expect when you pick it up. I have no problems with retro-style controls. Indeed, they often make a lot more sense than some of the modern control methodologies on some recent cameras. Dials are nice as long as they stay put, which the X-Pro1's definitely tend to do. The one exception is the aperture ring on the lens. In two of my three lenses, this ring is a bit on the loose side. While there are click stops, they're soft, and there's no strong click at the A (automatic) mark. I'm not a huge fan of the A mark on the aperture and shutter speed dials, and the loose aperture ring plays into that. If both are set to A you're basically in Program exposure mode. If neither is set to A you're in Manual exposure mode. If you move off the A on one ring, you're in priority for that option. So here's the problem: a slight jostle and you've moved the aperture ring off A and onto f/16. I didn't do this often, and I caught it immediately every time, but fixing it slows me down in taking images. But there is one thing about the "retro" design that bothers me: button positions. Yes, it's nice that we've got dedicated controls for most everything, but they should be in the right places. In particular, the Drive, AE, and AF buttons are in an awkward spot at the left edge of the back, and the fact that they're all the same size and texture means it's a little more difficult to find the right one by feel (you'll be sticking your finger up near your nose as you do). The command dial also feels under utilized. Since its big (some might say only) utility is with the Q button (quick menu), it seems like the Q button ought to be next to the dial. It'd also be nice if the dial worked for rapidly scrolling main menu items, too. This is especially true since you can see the menus in the EVF if you'd like and your thumb will be in the perfect position to scroll the menus via the dial. A big miss on Fujifilm's part. Auto ISO once again runs into engineers not thinking through practical photographic use. You can set Auto ISO values, but you have no control over when the camera decides to boost. In Program exposure mode (both dials set to A), the X-Pro1, like many other cameras before it, sets too slow a shutter speed more often than not. We really need more control than On/Off and a top ISO value. Fujifilm's menus for the first time finally seem to have some logical thought behind them. There are five SHOOTING menus and three SETUP menus. But unlike all the previous Fujifilm cameras I've used, it seems that someone has actually thought about which options should go on the same page. The first SHOOTING menu page has ISO, size, quality, dynamic range, and film looks, for instance. Arguably the things you might be considering together. The second page is white balance, color, sharpness, highlight, shadow, and noise reduction. Again, things you might consider using together. But...white balance probably should be on the first page. The self-timer shouldn't be buried in the menus at all, even the first page of menus; it needed a button or external control. Fortunately, self-timer is one of the Q button options, though it still takes too much button pressing to make it active. Overall, the menu system is far cleaner on the X-Pro1 than it has been on any previous Fujifilm camera. So I'll give them full marks for improvement. The EVF has a bit too much lag to it. At least compared to other EVFs that have been appearing lately. You'll need to learn to anticipate if you use the EVF form of viewfinder. Obviously, that's one reason why having the optical option is nice. But there's also a short pause when switching between the two, so you have to be a bit careful to pick which option you're going to use before the action starts. Also, Fujifilm messed up big time in one way: there's no diopter adjustment for the viewfinder. In theory, you can get screw-in replacements that change the focus point to correct for your vision, but I have not seen this option offered by Fujifilm (hint: the Nikon diopters for the FM2 and FM3a will work on the X-Pro1). [Update 7/27/2012: Fujifilm has announced they will produce +3, +2, +1, -1, -2, and -3 diopters for US$19, available in August.] I have 20/20 corrected vision, but not at the close distance the EVF is placed. I have to move back almost a finger's width from the eyepiece to get the EVF in focus. This is a bonehead design mistake on a US$1700 camera. Something that would have cost them less than a dollar to fix. Which brings me to my main complaint. In theory, the X-Pro1 should be a great camera for street shooting, much like a Leica M. But it's not quite enough of a spontaneous camera for me for street shooting. Beyond the fact that it feels like I have to pay a bit more attention to the camera (dials, control placements), switching between viewfinders and other attributes make me get to the way I want to shoot just a little more slowly than I do with my DSLRs. I find myself shooting more slowly with the X-Pro1 than I do with, say, the NEX-7 or E-M5. One little quibble: if you're in macro mode you'll be forced to the EVF. That makes sense, as the OVF is offset and you'd have even more parallax issues than usual. But if you hit the viewfinder switch on the front, nothing happens. I think it should just drop you out of macro mode and into the OVF as you requested. Fujifilm unfortunately forces you do multiple button presses to get out of macro mode (macro, left, OK), which is just another of those "slow you down" things. [It was pointed out to me by a reader that there's a shortcut: press the macro button twice to cancel macro; okay, that's better, but not intuitive.] This isn't the only instance of one, either. The more I use the camera the more of these sequence-instead-of-direct issues I find. A comment about lenses: the lenses come with thin, soft pouches. Some people will want more protection, but I happen to like them, as my gear is usually already in a bag with adequate padding. The pouches keep the lenses from picking up dirt and fingerprints when I'm in a hurry (though make sure you keep the inside of the pouches clean!). Some people also complain about the hoods and caps for the lenses. The rectangular-front hoods are actually quite good at suppressing sidelight from hitting the front of the lens, and the rectangular front allows them to be a bit shorter while providing full side light protection. The problem, however, is the caps. The rubber caps are push-on-and-fall-off. The more you use the caps, the less tight they get, and the more likely that they'll fall off when you're not looking. That's a shame. Because the hoods are nice, but you're going to want to remove the hoods and use regular lens caps that aren't as prone to coming off. So we have another of those "nice touch, but..." situations here. I suspect a lot of people will be buying regular lens hoods for their X-Pro1 18mm and 35mm lenses. One place to do that is Jacquelinelife on eBay, which sells a hood+cap for each of the lenses at low prices. Battery: Not exceptional battery performance. I got about 250-300 shots on a charge in my first couple of uses of the camera. Perhaps that'll improve as I learn what's drawing the most power in my usage patterns. The battery indicator needs recalibrating, though. The battery claims it is full far too long. You can't trust what it says, as it'll go from full to empty very quickly as you get towards the end of a charge. Write Speed: One of the big complaints about Fujifilm DSLRs was that they were very slow in writing to cards. Coupled with smallish buffers compared to competitors, this made for some frustrating times. Unfortunately, Fujifilm hasn't fixed this problem with the X-Pro1. If there is any performance issue that makes me question the value of this camera, it's the raw buffer and write performance. The buffer is only 12-14 images, so relatively small compared to DSLRs. In scenes that demand some fairly rapid shooting, it's entirely too easy to fill the buffer and hit the dreaded wait icon when shooting raw, especially if you want to review images. Even on the fastest cards I've got (95MBs) the X-Pro1 was very slow to write a full buffer to the card (20 seconds). With slower cards, it was still slower. Like the autofocus (see next), Fujifilm is a long way from state of the art. Indeed, they were not state-of-the-art 7 years ago with their DSLRs, and they aren't closer today. If anything, they're further from state-of-the-art. The write performance feels very 2003 to me. Autofocus: One of the big complaints from others about the X-Pro1 has been its autofocus system. It certainly isn't state-of-the-art fast. In continuous mode (AFC) it's decidedly non-fast and only uses the center point for tracking subjects. In some cases where I reframed in good light it took as much as a second to recapture focus. In single mode (AFS) the X-Pro1 doesn't match the m4/3 cameras, let alone the Nikon 1 models, but it isn't as bad as some seem to imply. Even in low light (where I needed ISO 6400 for an image) I was usually able to obtain focus, albeit not at anything approaching DSLR speeds. Think compact camera of a couple a years ago and you've probably got a good sense of what to expect. The autofocus didn't bother me quite as much as the manual focus. While the X-Pro1 gives you a distance scale at the bottom of the viewfinder when you're in MF, the required ring rotation is so much that my hand then gets in the way of the optical viewfinder while I'm doing the rotation, which forces me to use the EVF if I want to stay on top of what the subject is doing. [You can press the AE-L/AF-L button for a quick one-press autofocus, which helps, but I still find that I often am doing more lens ring twisting than I'd like.] Indeed, for street photography, I kept finding myself going back to the old ways: smaller aperture, fixed focus distance with a known depth of field, and then only shooting things within that DOF. Using any of the focus methods (AFS, AFC, manual) all had their slight disadvantages in street shooting. Oh, and another of those slow sequences: if you've been shooting in macro focus mode and then decide to point the camera at a far scene, the camera won't give up on macro and try focusing at longer distances. While that seems like I'm complaining about autofocus on the X-Pro1 I again repeat that it wasn't as bad as some have made it out to be. It's just clearly slower than other options I have available. Had this camera come out five years ago, we wouldn't be talking about focus speed. But state-of-the-art has moved on, and the X-Pro1 is not state-of-the-art in focus in any way imaginable. Indeed, that's a common theme in most of the performance aspects: not state-of-the-art. The X-Pro1's focus is competent and reliable up to a point, but it's not anything that could be described as fast. Personally, I think most of the people who'd be attracted to this camera in the first place aren't truly seeking state-of-the-art fast, so they might not be put off by the speed of the focus system. Tip: if you're having troubles focusing on something, tilt the camera 45 degrees and focus. The X-Pro1 seems to have a problem with low contrast on the long axis, but if you get lines at a diagonal, it will find them fine. The other problem that some claim for the focus system is the accuracy of the focus indicator in the optical viewfinder mode. Having the camera adjust for viewfinder parallax to place the AF indicator more accurately worked well enough for me, but I do see that's it's not fully accurate. It takes a little practice to take advantage of this feature. But I didn't find the accuracy of the indicator any worse than the indicators in most DSLRs. You have to learn what the camera is doing and what it's trying to tell you to take full advantage. Overall, the X-Pro1's focus performance was compact-level at best, but not the terrible mess that some reviews seem to have suggested. On the other hand, the shallow DOF capabilities of the camera's large sensor mean that you can get into situations where even a slow moving subject can move enough to lose focus by the time you press the shutter release in AFS mode. I can live with the focus system as it is, but one of the reasons why I can live with it is that the camera isn't fast at just about anything. It's a camera for a deliberate, slower shooter, in my opinion, and the autofocus system simply matches that. You won't be shooting fast moving subjects with this camera. Image Quality: the large APS sensor definitely performs in low light. Moreover, the extra concentration of green photosites means that luminance information is quite good on this camera. Luminance noise is quite low and I'm not at all afraid to shoot with this camera out to ISO 6400. Indeed, one of the first things I did with this camera was shoot a dress rehearsal at a local theatre that's renown for its dim lighting and where ISO 6400 is my usual base ISO. As I was shooting, the director happened to notice my LCD playing back something and immediately remarked "wow, it looks like we actually lit the place." Indeed, the ISO 6400 images were quite good, perhaps better than any of my other APS sensor cameras. This represents a huge improvement over Fujifilm's DSLRs. They obviously learned a few things since the last SuperCCD sensor they made. But heck, it represents a huge improvement over most DSLRs. Overall, this is a camera that can handle low light well, if not excellently. The lack of an AA filter means that detail and acuity is quite high, too. The combination of this and the low luminance noise actually makes the X-Pro1 a very good monochrome camera, as well. I'd put the X-Pro1 images up against those of the non-AA Leica M9 in most respects. Indeed, at higher ISO levels, the X-Pro1 is clearly the better choice. From the standpoint of detail and acuity (with a caveat I'll get to), the X-Pro1 stands right up there with the best. Some of that is the great lenses, though. While the X-Pro1 clearly beats the NEX-7 in handling fine detail, it's not the lack of the AA filter that is the big contributor: it's the excellent Fujifilm lenses compared to the (mostly) mediocre Sony ones. The worst Fujifilm lens (18mm) is as good as the best Sony lens (24mm). Those that like Fujifilm's "color" won't be disappointed. JPEGs coming out of the X-Pro1 remind me a lot of the Fujifilm DSLRs: contrasty, sharp, with some color punch. Some of that punch is inaccurate color. As usual, Fujifilm is doing a double hue shift in the greens and reds, pushing both a bit towards yellow. Fujifilm includes their usual poor film simulations. Velvia isn't anything like Velvia, though the "vivid" addition to the name is indeed true. Likewise, the Provia, Astia, and Pro Neg "simulations" don't exactly match their films, either. Still, you've got some interesting choices in that mix, and those that value "Fujifilm color" will find what they were looking for somewhere in the X-Pro1's JPEG settings. While the camera has the usual Fujifilm Dynamic Range choices (100%, 200%, and 400%, which is a very non-photographic way of staying normal, one-stop additional, and two-stops additional range), it isn't a built-in sensor capability as it was in the SuperCCD SR cameras. Instead, it appears that Fujifilm is doing the usual pixel adjustments that others do under their own proprietary names for the effect. In short, it's a contrast/gamma adjustment system. In one sense, the X-Pro1 has a fairly high useful dynamic range that can handle really tough subjects (see image, below). Color doesn't track quite the same, though. I see some slight color issues at very high ISO values as colors drift a bit, especially with Fujifilm's JPEG noise suppression in effect. Nothing terrible, as the camera is decidedly useful at ISO 3200 and higher depending upon your tolerance for low level noise and loss of color definition in the shadows. I'm not yet sure that we've seen the best the X-Pro1 can do, though. I see enough variation in low level details and color information between all the available raw converters that I doubt that we've seen the best this camera can do yet. I suspect that's going to come from third-party experimentation, not Fujifilm's sharing of knowledge with raw converter coders, though. What's happening is that the low level of color information is causing the raw converter makers to have to figure out a way to get it for each position, and they appear to be using some form of what's called mean filtering. The narrow white strips are being washed pink in this example, but I've seen plenty of other more subtle but just as debilitating examples in other raw files. See part three of Sandy McGuffog's treatise on X-Trans conversion to get a better understanding of mean versus median filtering in demosaic engines. The problem is that you'll see different behavior in different images. Sometimes the circumstances don't generate any real color smearing. Sometimes you get horrid color smearing with the Adobe converters (less so with Silkypix and JPEGs). The problem is that we're really reaching for color information in some low level details, and the eventual answer will be to do even more processing during the conversion (meaning slower conversions). So the question becomes whether this color smearing is a serious enough issue to impact image quality. I believe so, at least in its present form. When the problem arises in the low level pixels, it starts to impact other processing you might do, like sharpening. Much like you get an unreal look when you try to sharpen something that has been severely noise reduced, you also get unnatural looks when you try to sharpen edges near color smear (the sharpening pushes the color back into the edge and the edge into the color). If you're a pixel peeper, you're going to be appalled the first time you encounter this in your raw files. And a lot of the folk who want a 16mp camera are pixel peepers, so they'll eventually notice something is amiss. If you're going to try to push your X-Pro1 shots up past a 16" print (long axis), the color smearing is definitely something that will impinge on what you can do with some images. If you stay below that, I'd say that the problem is mostly buried in the pixels deep enough that it is ignorable. But I think the first sentence in this paragraph is going to be a disappointment to many who were considering the X-Pro1. There's a lot of fan-boy denial going on out there, so be careful of what you read. For instance, some claim that the supplied Silkypix converter solves the problem. It does a better job than the Adobe converters at the moment, but the Silkypix converter definitely is trading one thing (detail) for another (some color smear). Another issue is that not every image is going to trigger a visible problem, so some look at an image, see no problem, and think that the problem I'm writing about (as others now are) is non-existent. Unfortunately, it's real, and it will catch some by surprise, especially if they try to print big and/or use the wrong converter (which will make the problem more visible). The bottom line is that Fujifilm is promoting the X-Trans sensor as getting rid of the moire problem. Yet it introduces another just as bad random problem in color smearing. Other than that, as 16mp cameras go, the X-Pro1 is near the top in terms of usable image quality, if not at the top. It produces excellent JPEG files at any ISO you're likely to shoot at. That might be enough for some people to push them into buying the camera. The camera is just enough idiosyncratic and is a work-slow camera that I believe you should make sure you really value image quality so highly before jumping at the image quality, though. And then you have to consider what you think about the color smearing and can live with that when it occurs. That's actually one of the conundrums we see often in the digital camera business, though a bit less so recently than previously: you often have to give up one thing to get another. Given the price that this camera and its lenses will set you back, you want to be very sure about the balance point before making the leap. That said, if the Leica M9 is on your strongly consider list, the X-Pro1 probably knocks it off. As much as the Leica is a nice camera, it's not US$5200 better than the X-Pro1, indeed, it might not be better at all (other than the status and resale values). I know I'll get jumped on by a few Leica users about that statement, but the list of the M9's deficiencies to the X-Pro1 is rather long: worse low light performance, manual focus only, a worse LCD, less information in the viewfinder (even optical), slower flash sync, slower frame rate, amongst other things. Given the Fujifilm's M-mount adapter, the only thing that gives pause in choosing between the two is the Leica's full frame versus the X-Pro1's APS frame. Yet, even then I think I'd opt for the Fujifilm, especially if Fujifilm releases the 14mm lens they say they're developing: for both wide angle and telephoto work, getting the framing right is easier with the X-Pro1, I think. Lenses: Since we've only got three lenses at the moment, it's easy enough to give a mini-review here. Let's start with the good news: the 60mm f/2.4 Macro is exceptional in almost every way, though it is a fairly large and weighty lens. It's sharp from corner to corner, has little distortion or other problem attributes, and it makes for a good portrait lens and an excellent macro lens. Focusing will be a bit of an issue if your subject is moving, but that's not really the lenses' fault. The 35mm f/1.4 is the lens most of you will get first, and you should. It's a very good normal lens, and like the 60mm is sharp, even into the corners. There's a bit of loss of contrast wide open, but it's very usable wide open. It's a teeny bit long for "normal" for me (should be 30mm), but certainly in the range we call normal. If you own an X-Pro1, you have to have this lens. The 18mm f/2 is the weakest of the bunch. Like many wide angles, it gets quite weak in the corners. It also has visible linear distortion and a fair amount of vignetting wide open. It's still a pretty good optic, as the center field is sharp, even wide open. Still, if you pixel peep, you'll definitely notice the difference between this lens and the 35mm. At 18mm, we're only at 28mm equivalent, which isn't very wide, so I'm a little surprised at the lack of better performance. The attributes I see here are more what I'd expect out of a 16mm lens, not 18mm. That said, it's still a good lens. Certainly a better wide angle choice for the X-Pro1 than the 16mm f/2.8 is for the Sony NEX-7. Performance Overall: There was a lot of early debate in discussions when the X-Pro1 was first announced about whether the X-Pro1 might be the "best mirrorless camera yet." Much of that revolved around the 16mp APS sensor without an AA filter. The reality is that the X-Pro1 is arguably not the best mirrorless camera. Too many small "gotchas" make the reality of using the camera not support the high expectations for it. Autofocus and write speed performance are sub-par. Image quality has an ugly downside if your subject triggers the color smear issue. Whether you'll be bothered by that will depend a bit on how large your output is. On an 8x10" print the bad news in an X-Pro1 raw conversion is hidden from view, but if you're wanting 16mp to "go big," you'll eventually see it. JPEG shooters will probably like the X-Pro1's output, at least if they're not going to prints as big as they can make. Raw shooters will be bothered by the low level X-Tran issues in the current converters. So, no, the X-Pro1 is not the "best mirrorless camera yet." It's good at many things, great at a few, and it even may be the right camera for you, but given the choices currently on my desk, it isn't the one I grab for. I wanted to like the X-Pro1. On paper, many of the things I valued back in my early film days are present here, and the large 16mp sensor without AA promises excellent image quality. Unfortunately, Fujifilm has done the same thing with the X-Pro1 as they did with their now-abandoned DSLR line. The odd-ball sensor delivers something very unique and useful (but with a caveat), while the rest of the camera tends to let the sensor down a bit. So that really only leaves us image quality to lean on. There, at least, the X-Pro1 delivers. From bright to low light, I was able to get very nice JPEGs out of this camera, and the raw files would be right up there if we really had a converter that could pull everything out of them that's possible, something I'm not convinced we have yet. Leica M9—This is an easy decision now that Fujifilm has released their M-mount adapter. In some ways, Fujifilm corrects M-mount lenses better than Leica does. The APS sensor means that you'll need to pay close attention to your wide options (the 15mm Voigtlander comes to mind), but you can put together a full kit that'll be competitive with what you'd get from the Leica for a lot less. You'd lose 2mp, but you'd gain some high ISO capability. JPEGs are also better out of the X-Pro1 than the Leica, in my opinion. So I think it's an easy decision if you're thinking about these two options: get the X-Pro1. 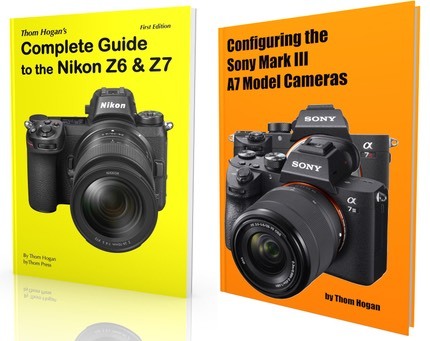 Sony NEX-7—A much tougher decision, as it turns out. Sure, you're giving up retro and the hybrid viewfinder, but you're also getting a smaller camera, many zoom choices, better autofocus (and manual focus for that matter), and a more flexible LCD. From an image quality standpoint, it's a tough call. Part of what makes the X-Pro1 so good is its lenses, part of what's holding the NEX-7 back is its lenses (other than the 24mm and the 50mm). Note, though, that there's an M-mount adapter for the NEX, indeed, virtually an adapter for every large format mount. Still, even with Sony's lenses most people are going to be hard-pressed to distinguish between the X-Pro1 and NEX-7 when handled perfectly. On top of everything else, you'd save US$500 on the NEX-7, so you could put this to better glass. Olympus E-M5—Here the primary factor is really what type of shooter you are. If you're a DSLR-type shooter, the E-M5 will feel natural to you, the X-Pro1 slightly less so. That's especially true because the E-M5 EVF is better (faster refresh, for one). Unlike the Sony, Olympus has plenty of high quality lenses to stick on the camera. But 16mp m4/3 with an AA is not the same as 16mp APS without an AA. The Fujifilm has a bit of a sensor advantage, here. Unfortunately, most of the other advantages accrue to the Olympus: focus, flash flexibility, buffer/write speed, and more. I guess I'd put it this way: if you're an impatient or quick shooter, the Olympus is your choice. If you're a deliberate, slow shooter who values every last bit of image quality and doesn't mind the lack of zoom lenses, the Fujifilm has to be considered. Personally, I'd pick the NEX-7 or E-M5 over the X-Pro1 and the X-Pro1 over the Leica. That's because I need a highly variable range of options (lenses) and both focus plus write performance is important to me. I'm also a DSLR shooter, not a rangefinder shooter, so my style best fits the E-M5 (though the NEX-7 is fine, too). I really wanted to like the X-Pro1—and I do in that strange way you like your odd-ball cousin who seems a bit on the crazy side—but it feels like a camera that would have wowed everyone three or four years ago but is already showing some age. It's definitely not the camera to get if you're a state-of-the-artist. The focus and buffer/write performance will quickly get old. Funny thing is, Fujifilm, like Leica, seems to have figured out how to make a 1960's camera in the 2010's. As I've written before, there was nothing particularly wrong with many film cameras. Even today picking up a Leica M3, Olympus OM-4, Nikkormat FTN, or any of the many other examples from an earlier era wouldn't exactly stop a real photographer from getting great images. They'd work a little slower, they'd have to do a bit more thinking, and they wouldn't have a tremendous amount of electronic auto-features to lean on, but they'd get the photo. If that describes you, then the X-Pro1 is definitely worth a look. It has exceptional image quality when handled right, and it's built well and easy enough to figure out without looking at a manual (okay, a few things will have you looking in the manual, but not many). I'm going to give the X-Pro1 a qualified "Recommended" rating [no longer valid, as cameras have moved on]. Careful, deliberate shooters will love it. Rushed, spontaneous shooters won't like it as much. Action and really fast shooters won't like it all. For the first group, it's "Recommended," for the second it's "Recommended (with reservations)", while for the final group it's "Not Recommended." 2018: this model is out of production and no longer available new. But used copies can easily be found. Also, check out the current X-Pro2 model.